I took three years of German in high school and one semester at Penn State to fulfill my foreign language requirement. One might think I regret choosing German over Spanish since I married into a Spanish-speaking family. I dunno. Even after 9 years of marriage, I'm still struggling to hablo some bueno Español, but all through those school years, the kids who took French, Spanish, and Latin wandered the halls, frazzled and frustrated, trying to cram for their latest vocab quiz, while the German students pranced around singing songs— "Sie liebt dich, ja, ja, ja!" —and looking forward to their next Deutsche Klasse. There's just something about German that's intrinsically fun. In addition to the language, we learned exciting things about German culture like Oktoberfest, the speed limit-less highway known as the Autobahn, and even some pop culture tidbits via Deutsche Welle—like German music videos. For that reason, I think we retained a lot of what we learned. 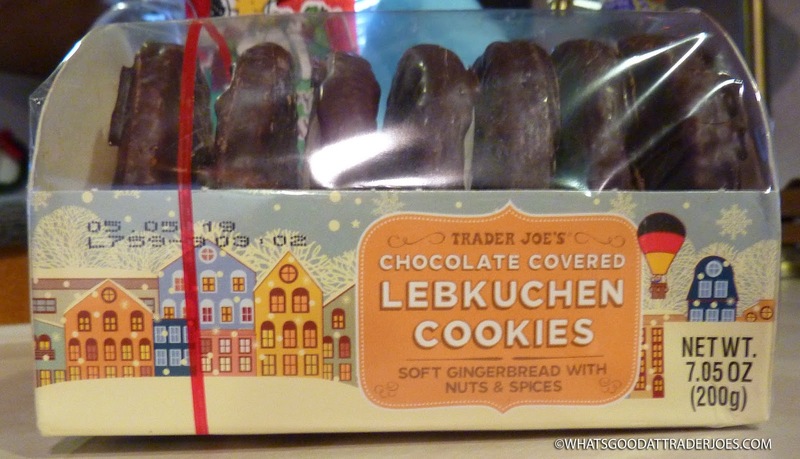 I don't recall specifically hearing about Lebkuchen, but as soon as I saw them at Trader Joe's, I immediately knew they were cookies—kuchen. According to Wikipedia, the "Leb" part of the equation is less clear, but I immediately assumed it came from the same root word as Leben, the German word for "life." I figured it must have been like the medieval German equivalent to that silliness that Millennials are always saying on social media: "These cookies are giving me life." And they do indeed "give life." Their insides are vaguely reminiscent of another traditional German treat we looked at on this blog many years ago, but not quite as heavy on the spices. It's similar to gingerbread—soft and slightly chewy—almost spongy. There's a citrusy essence to them, as well, since they've got candied orange peel mixed in—it's not overbearing, though. Almonds, walnuts, and hazelnuts give them a nutty flavor. 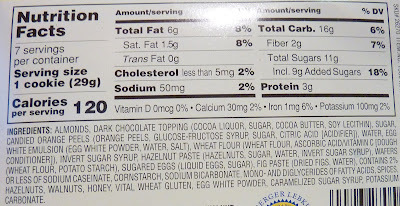 The chocolate coating is waxy, thin, and semi-sweet. It goes together with the bread pretty well, although the combination of the two textures is relatively foreign to both Sonia and I. The undersides of the cookies are like very thin wafers—yet a third distinct texture to add to the mix—although it's not as noticeable as the first two. Although she was initially turned off by the sponginess of the inner-cookie, Sonia fell in love after a few bites, since the cookies paired so perfectly with coffee. She was happy to have a holiday snack that's a bit of a departure from the norm. No doubt someday our insatiable wanderlust will take us to international destinations like Deutschland, but until then, we're thankful to have snacks like these at Trader Joe's. 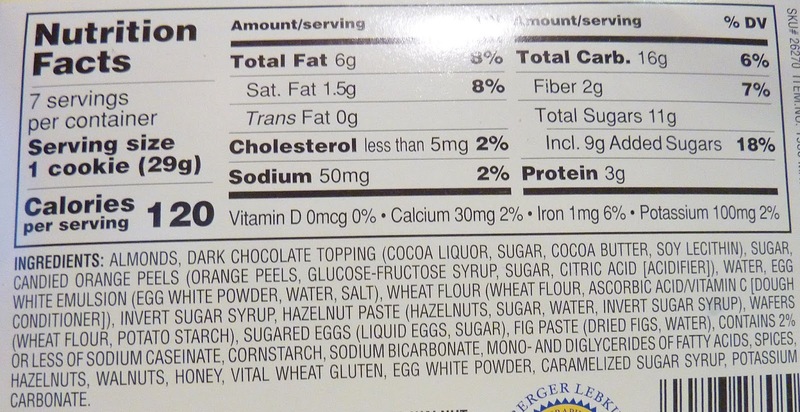 Double fours for these cookies. Drat. Why do they have to ruin a perfectly good cookie with walnuts? they're far down the list but I would know they're there. Frankenmuth Michigan (about an hour from Detroit). Like a little slice of Germany in Midwest America. We'll add that to our list of places to visit. I strangely love these! I get a package of them every year and then I’m good til next year. The texture combo is a little odd, but they have the best combo of spices and aren’t overly sweet. Hope you’re heading to some warmer states soon! ImI waiting for you to review the Snowflake Pastry. I tried it and am wondering what your thoughts were about it. Jumping in here to show some Penn State alumni love. Tried these for the first time last week. I never had lebkuchen before, but I enjoyed these! 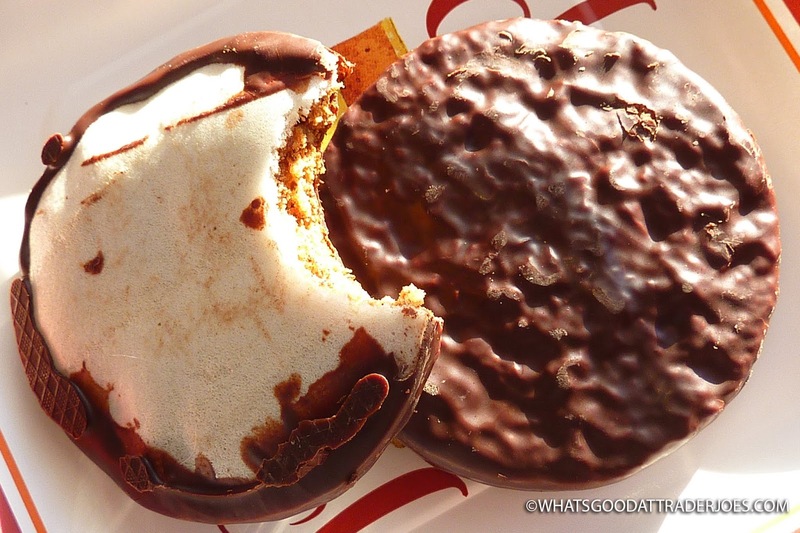 I especially enjoyed the sugar-glazed lebkuchen even more than the chocolate one. Have you tried the sugar-glazed ones?